FRUITPORT, MI – Prayer and worship service are a regular occurrence in the chapel at Calvary Christian Schools. Friday morning’s chapel session hit very close to home for students, faculty and the school community. They were literally praying for one of their own. “I’ve seen a lot of blank stares from the kids and fear – they saw something that they should have never seen,” said Todd Ballard, lead pastor for The Lakes Church, who works with the Calvary Christian students. Simply put, they’re thankful that Luke Anhalt, a 17-year-old Calvary Christian senior, is still alive. They’re also praising the fact that Luke was in the right place and in the right hands at the time he suffered a potentially-fatal heart issue during basketball practice Thursday afternoon. “We’re praising God for his recovery and appreciative of his coaches and teammates who we believe saved his life yesterday,” Luke’s father, Dr. Jeffrey Anhalt, said in a phone interview with MLive from Helen DeVos Children’s Hospital in Grand Rapids, where his son is showing positive signs of recovery. Jeff Anhalt, a local orthopedic surgeon, noted that is son is doing “actually great” and starting to come around. More tests are to come, he said, but this could have been a much different story. 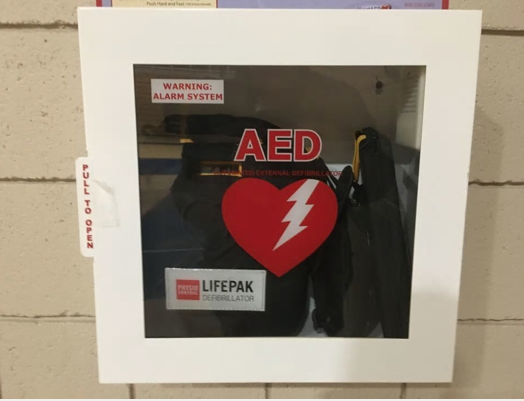 The moral of this story, in the mind of Calvary Christian administrator Tom Kapanka, is that schools not only need to have AEDs (Automated External Defibrillators), but that there are procedures in place for making sure the devices are up-to-date and used properly. Near the end of practice Thursday, Calvary Christian’s basketball team was shooting free throws when Luke collapsed to the gymnasium floor. He was resuscitated with an AED in the gym and because of the quick response by his basketball coach and teammates. Calvary Christian basketball coach Jeff Zehr, who is a local chiropractor, used the AED machine and administered CPR, essentially buying time until first responders could arrive at the school. Luke had a heartbeat and was breathing when he left the school, and he was transported by ambulance to Mercy Health Mercy Campus. He was transported to DeVos Hospital Thursday night. “That’s exactly how it’s supposed to work and this is the best perceived outcome from that,” Jeffrey Anhalt said about the use of AEDs. “Called 9-1-1 and got the AED on him immediately, and then followed the directions. The call to the ER took 13 minutes, so if he had 13 minutes of downtime, he wouldn’t be talking to us this morning and we’d have a completely different outcome. Ballard also was at the school Thursday afternoon, when Luke collapsed. “I had just left basketball practice maybe 10 minutes before that because I’m usually at practice with them …,” Ballard said. “My offices are just above the gym area. Came down, heard the alarm going off, kids were crying, and I ran in there and they were doing CPR on him and I just started praying – that’s all I can do. I believe in Jesus Christ; I believe he’s the one who sustains life, and so that’s who we called out to. We called out to Jesus and some of the basketball players were sitting there praying. Jeffrey Anhalt said that his son has no history of fainting or feeling light-headed, nor has he shown any signs associated with cardiac dysfunction. Dr. Anhalt also said that, at the moment his son collapsed, he suffered from either ventricular fibrillation or ventricular tachycardia. In either case, it’s a shockable rhythm that does not pump enough blood to support normal function. Jeffrey Anhalt added that Luke does not have hypertrophic cardiomyopathy (enlarged heart), in which you’ll see a thickened heart wall that causes a problem, nor does he have an enlarged ventricle. In two of the more notable and tragic cases in West Michigan in recent memory, Grandville hockey player Ryan Fischer and Fennville basketball player Wes Leonard both died and it was later discovered that they had enlarged hearts. Their respective causes of death were different, however. Fischer, 17, died of hypertrophic cardiomyopathy, while Leonard, 16, had an enlarged heart caused by ARVC (arrhythmogenic right ventricular cardiomyopathy). According to Kapanka, Michigan legislation does not require AEDs in schools. Calvary Christian has had AED machines for more than 15 years and his school’s staff is trained how to use them each fall. 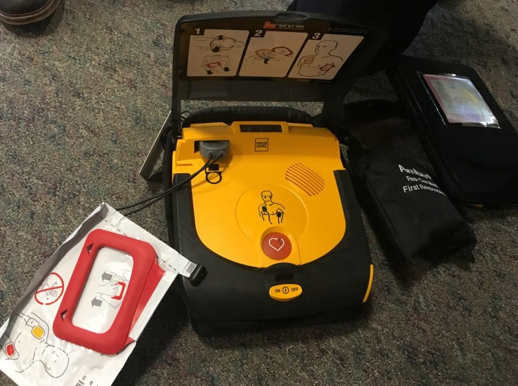 Calvary Christian has two AEDs – one in the gymnasium and another closer to the lobby area near the main office – that both came from foundations. One was supplied by Osteopathic Foundation of West Michigan, and the other was furnished by Kimberly Anne Gillary Foundation. “I think it’s very important (to have them). Are they costly? To some degree, but they relatively in nature have come down in price and when an event like this takes place and the outcome is what is has become, how do you put a price on that?” said Brian Michelli, public safety director for Fruitport Police Department, who was one of the first responders Thursday, and who also is part of the Calvary Christian Schools community. Kapanka said that the batteries in AED machines last about three years and that the pads also have a shelf life, so he recommends keeping the devices as updated as possible. He added that the distributor of the AED equipment was sending a representative from Detroit Friday to Calvary Christian to pick up the device and download the data. He said it will provide a readout of exactly what happened, and that DeVos Hospital will be able to use that data as it relates to Luke. “That same company sends us emails throughout the year with updates and reminders and the importance of keeping that equipment updated,” Kapanka said. According to Jeffrey Anhalt, it’s possible that they do not find a reason for Luke’s heart episode. He added that Luke could potentially have an implantable defibrillator with which he’d leave the hospital. 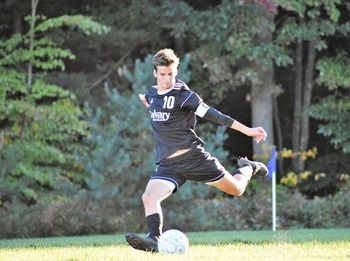 Anhalt is hoping that his son, who is a soccer recruit for Spring Arbor University and an all-state honorable-mention selection as a midfielder, is able to resume chasing his goals once he recovers. But, in reality, he’s thankful that Luke is alive. Calvary Christian’s scheduled boys basketball game Friday night at Fruitport was postponed after the incident. A new date has not been announced.